I thought I would try this. I found a couple chunks of frozen hamburger in the freezer. They recommend taking the flat pieces off the meat tray and freezing it flat. Mine were lumps, but it is all I could find. I put the hamburger in a clean plastic bag. They said it doesn't have to be a freezer bag, just a regular plastic storage bag is fine. Some people have voiced a concern to me about using plastic and the microwave. All I can say is that it doesn't get hot or the beef isn't being cooked in the bag. I wonder if the Beef Council has addressed this concern. I imagine a vented glass dish would work. Then chop up the hamburger after 1 minute instead of kneading it. Eventually I will try that method. These are chunkier than they recommend. Put the plastic bag in the microwave. Put the bag of frozen burger in the microwave. Seal the bag leaving one inch open and not sealed. Cook on high power for 1 minute. Take the bag out, let it rest for a minute and knead it to break up the frozen hamburger. Return it to the microwave and cook for 30 more seconds. 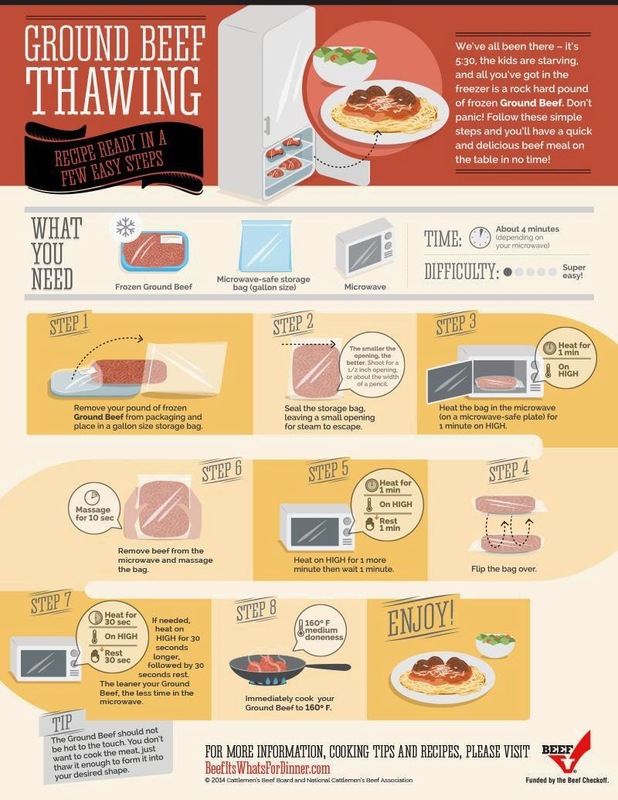 The exact instructions are in the chart and on the Beef Council website. Let it rest for 30 seconds and knead the bag again to break up the rest of the pieces. It worked beautifully. There were no hot spots or overcooked pieces. Ground beef thawed and recipe ready. Who knew? You learn something new everyday.